At the age of sixteen, R. Dwayne Betts-a good student from a lower- middle-class family-carjacked a man with a friend. He had never held a gun before, but within a matter of minutes he had committed six felonies. In Virginia, carjacking is a "certifiable" offense, meaning that Betts would be treated as an adult under state law. A bright young kid, he served his nine-year sentence as part of the adult population in some of the worst prisons in the state. 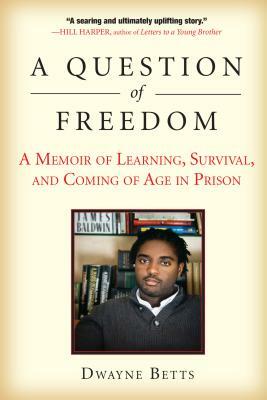 A Question of Freedom chronicles Betts's years in prison, reflecting back on his crime and looking ahead to how his experiences and the books he discovered while incarcerated would define him. Utterly alone, Betts confronts profound questions about violence, freedom, crime, race, and the justice system. Confined by cinder-block walls and barbed wire, he discovers the power of language through books, poetry, and his own pen. Above all, A Question of Freedom is about a quest for identity-one that guarantees Betts's survival in a hostile environment and that incorporates an understanding of how his own past led to the moment of his crime. R. Dwayne Betts was raised the only child of a single mother in Suitland, MD. At sixteen years old he carjacked a man and began the journey that would end with a nine year prison sentence in some of the toughest adult prisons in Virginia. The day he was released Dwayne walked into the world committed to proving his life wouldn’t be reduced to the thirty seconds he held a gun in his hand. Since that day, Dwayne has had his poetry published in many national literary journals and contributed an essay to Marita Golden’s anthology It’s All Love. He has been awarded the Holden Fellowship from MFA program for Writers at Warren Wilson College. A Cave Canem fellow, his poetry has appeared in Ploughshares, Crab Orchard Review and Poet Lore among others. He is a Breadloaf Writer’s Conference scholarship recipient and a graduate of Prince George’s Community College in Largo, MD and the University of Maryland in College Park, MD. He was recently given the honor of addressing his fellow graduates. In May, 2010, his book of poems, Shahid Reads His Own Palm will be published by Alice James Books. "Dwayne Betts was incarcerated for 10 years in an unforgiving place -- a place in which he also discovered the incredible power of books and reading. He's written his own life-changing book, which may well prevent other young men from making that detour to prison. A searing and ultimately uplifting story." "I'm so happy to have been introduced to the miracle that is R. Dwayne Betts' A Question of Freedom. It tells so many important stories: of senseless violence that plagues our streets, the devastating affect our prison system is having on so many young African-American males and the struggles we must all experience before we can find redemption. But perhaps most importantly, it's a story about the power of consciousness. A reminder that no matter how confining our surroundings might seem or how bleak our future might look, as long as we are in touch with our higher selves, we can always tap into both the compassion and the toughness that is in all of our hearts. Betts is a major new voice in hip-hop and I look forward to being inspired by him for years to come." "This book is a lesson on living. How does one become a man after being in a cell? A Question of Freedom is not a book of answers. Instead, this memoir is a minder that a black boy can turn his world around. Betts shows us that words are key. This book will unlock your compassion." "At last, a clear defining voice to express the feelings and hardships of so many young black boys trapped in America's prisons. A survivor among the countless lost souls, Dwayne loudly demands to be heard--in a soft and honest tone. A magnificent journey!"